The 2016 UEFL draft is complete; here are the results, and here is the 2016 standings page. Crew Chief Draft: There were 17 different crew chiefs drafted (100% of those available, not including the injured Tim Welke): The most commonly drafted was Joe West, who was selected 21 times, followed by Jeff Nelson, who was selected 10 times. The least commonly drafted was Brian Gorman, who was drafted once, followed by Fieldin Culbreth, Larry Vanover, Dana DeMuth, and Gary Cederstrom, who were each drafted two times. Primary Umpire Draft: 55 different umpires were drafted in the Primary, or 58.5% of the total field, not including T Welke (39 of 94 total umpires were not drafted in the Primary round). Dan Bellino was most commonly selected as a Primary Umpire (19 selections), followed by Joe West (13 times) and Angel Hernandez (12). 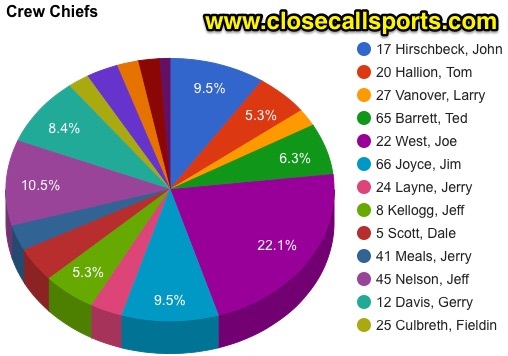 Secondary Umpire Draft: 59 different umpires were drafted as Secondaries, or 79.7% of the 74 Major League umpires available for the Secondary Draft. Vic Carapazza was the most drafted Secondary Umpire (15 selections), followed by Dan Bellino (12) and Joe West (11). Undrafted Free Agents: Umpires not selected in any of the above drafts include Chris Conroy, Mike DiMuro, David Rackley, Tony Randazzo, and Bill Welke. Additionally, Dana DeMuth, Brian Gorman, and Larry Vanover were only drafted in the Crew Chief category. For complete draft results, including interactive charts for the Crew Chief, Primary and Secondary Umpire drafts, click through to read more, and visit the 2016 Standings page on the UEFL Portal for updated standings information during the season.